Bibi Aisha was 18 when the Taliban came calling for her just before midnight. Forced into a mountain clearing in the southern Afghan province of Uruzgan, she was put on trial and convicted by a local commander. Her crime: fleeing from a violent husband and taking refuge in her family home. The punishment: she was held down while Aisha's husband took a knife and cut off her ears and nose. Left for dead on the mountainside, she was found by aid workers and eventually given shelter in a women's refuge centre in Kabul before finally leaving for the US, where she is due to receive reconstructive surgery. Her horrific story was part of Aryn Baker's TIME report on the plight of Afghan women in 2010, which included Fawzia Koofi, the former deputy speaker of the Afghan parliament, Olympic athlete Robina Muqimyar Jalalai, and Mozhdah Jamalzadah, a TV personality dubbed 'part Oprah, part Hannah Montana'. But it was Aisha's tale and the subsequent cover image taken by Jodi Bieber which captured global headlines and earned the South African photographer the overall World Press Photo prize. 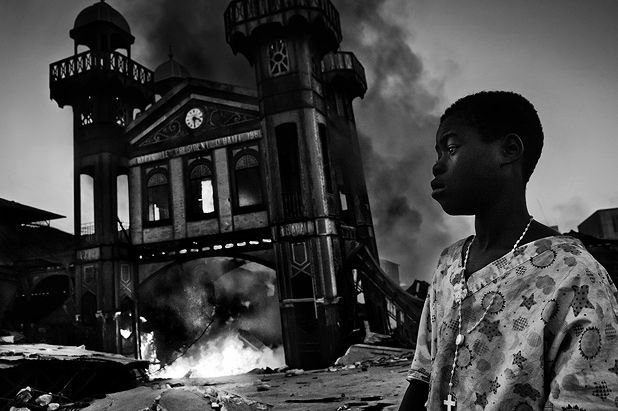 World Press Photo, Scottish Parliament, Holyrood Road, 0131 473 2000, 6–27 Aug, free. This winning photo in the General News section features a girl looking on as Port-au-Prince burns six days after Haiti was struck by a 7.0 magnitude earthquake. Another winner in the General News category features a more graphic version of events after the earthquake in Port-au-Prince as a man throws a dead body into a hospital morgue. 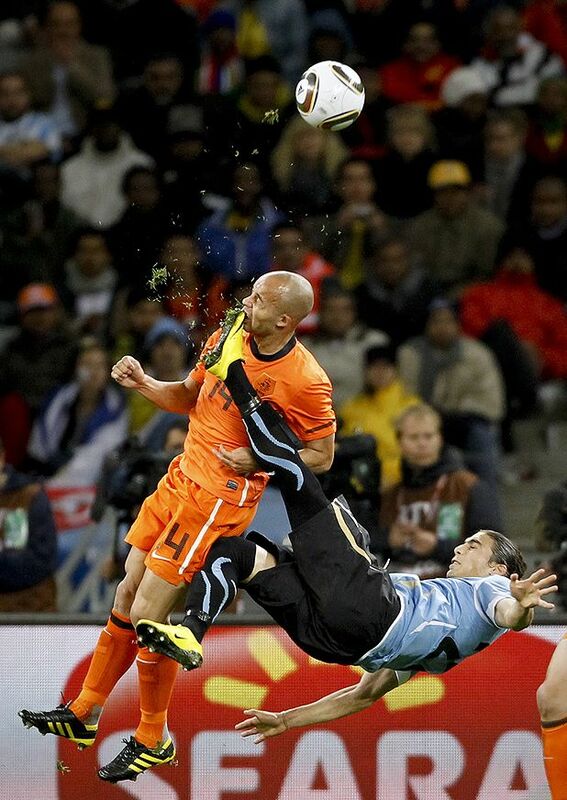 The winning image in the Sports section captures the moment when Holland's Demy de Zeeuw is accidentally kicked in the face by his Uruguayan opponent during the World Cup Semi Final in Cape Town. 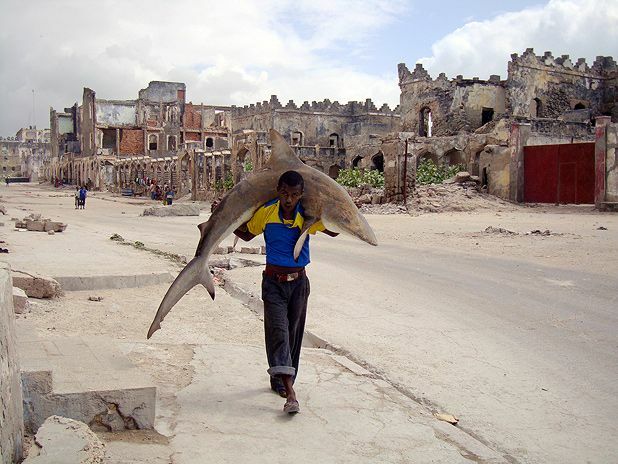 In this winner of the Daily Life section, a man carries a shark through the streets of Mogadishu after some heavy shelling in the Somali capital as part of the conflict between Islamist militants and pro-government troops. 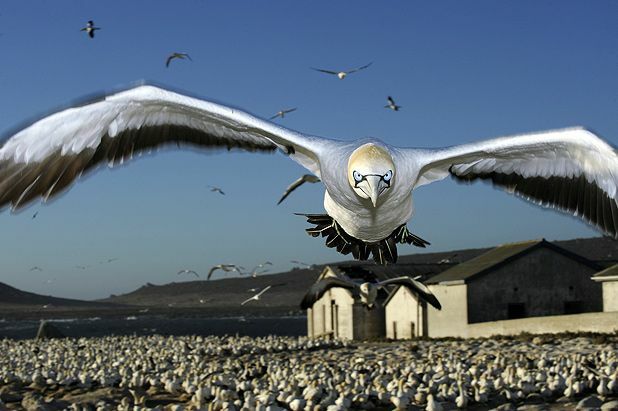 A Cape gannet comes in to land during the summer nesting season in this Nature section winner. Malgas Island, off the west coast of South Africa, is an important seabird breeding ground.